The Blue Ranger, fresh from battle! Inspired by the Mighty Morphin Power Rangers series. The limited edition canvas print includes artist Carlos Dattoli's signature! Measures 28-inches tall x 19-inches wide. 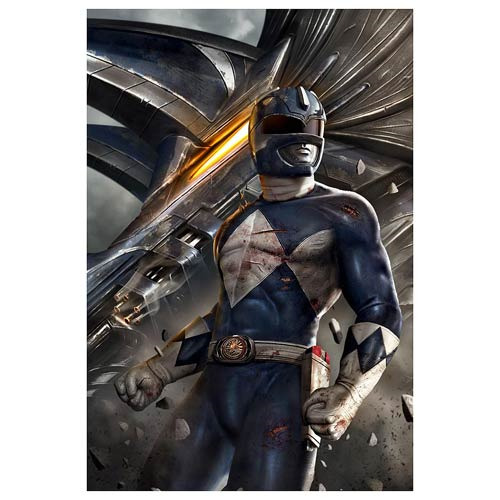 This Mighty Morphin Power Rangers Blue Ranger by Carlos Dattoli Canvas Giclee Art Print is a stunning rendition of the Blue Ranger, battle-scathed and standing in front of his mighty Dinozord. A limited edition of just 95 hand-numbered pieces featuring artist Carlos Dattoli's signature, the unframed 28-inch tall x 19-inch wide work of art is printed on canvas and comes with a certificate of authenticity.